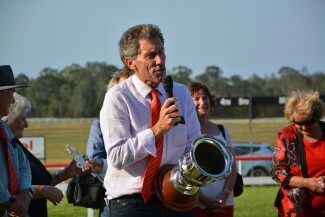 TERRY Treichel rode the perfect race on Villamill to land a Macleay win in the Kempsey Akubra Cup. The five-year-old bay mare is from the Peter Ball stable in Gladstone. She led from the front relatively early in the race and Treichel picked the right moment to move up a gear to establish an unassailable lead. Villamill - the $4 second-favourite - held off the challenge of Sir Will Do, ridden by Kassie Furness, to win by three-tenths of a length. Muhaajir, the $2.50 favourite was more than two lengths further behind in third. Ball hailed Treichel's tactical brilliance. "It was a perfect run," he said, "Terry gets 100 out of 100 for the way he handled her. "It's great for the Winklers (who own Villamill) and great for my own family." Ball's daughter Gaye, who looks after the mare, was positioned at the finishing line urging her past the post. "That was the most nervous I've ever been, Terry was just fantastic," she said. Owner Mark Winkler was almost speechless with delight. "It's the happiest day of my life in racing," he said. "It's a small cup, but to win your hometown's big race is just a dream come true."